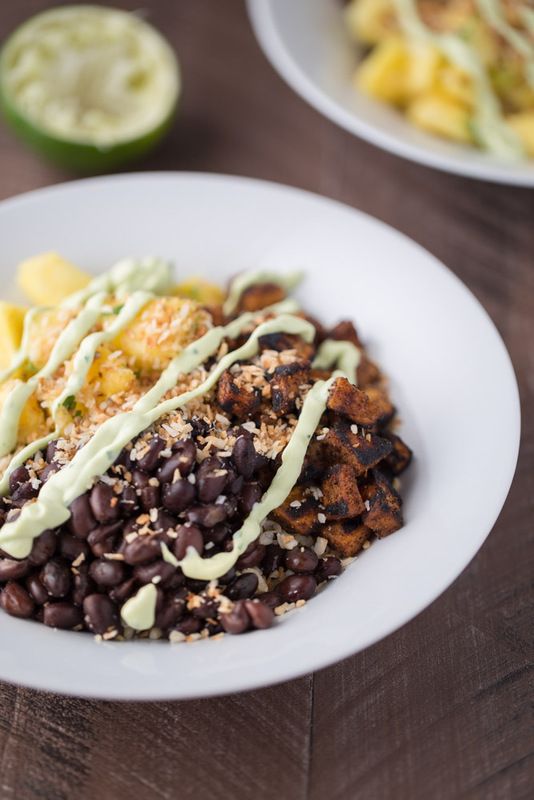 These tropical sweet potato burrito bowls will make you shout from rooftops with joy. Cumin seasoned sweet potatoes and black beans lay upon a bed of cilantro lime brown basmati rice. 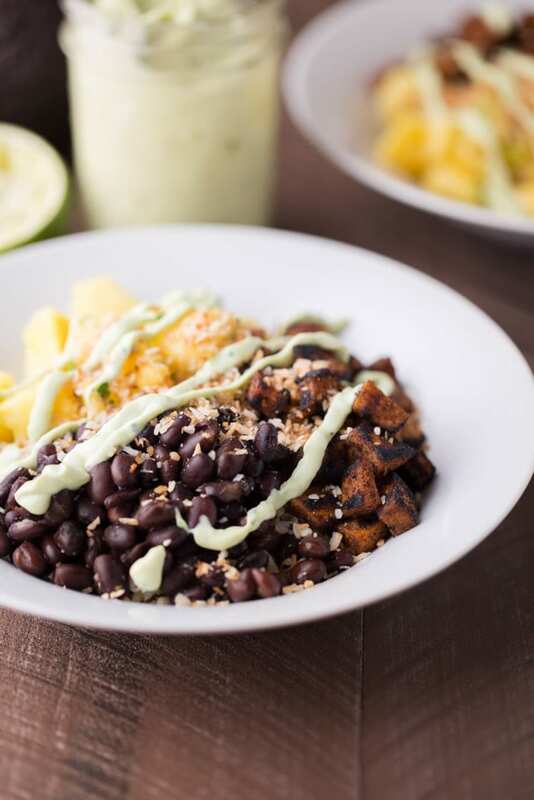 Pineapple salsa, toasted coconut and Greek yogurt avocado crema garnish this flavorful vegetarian meal. You will swoon over the flavors. You will want to eat them all the time. The tropical sweet potato burrito bowls will visit you in your dreams, giving you the best dreams of your life. You will wake up desperately looking for the sweet potato bowls that were right there in your dreams. But alas, it was just a dream. But you can make it a reality by following my easy recipe. That was sort of silly, wasn’t it? Tropical sweet potato burrito bowls visiting you in your dreams; who dreams about stuff like that. Do any of you have weird dreams? I often have weird, vivid dreams. Sometimes they are scary, often they are funny. I’ve woken up many times to find myself laughing out loud in response to something I was dreaming about. One time, I had a dream that my co-workers and I were riding flying mailboxes to work. I woke up laughing. I told my coworkers about it and they all laughed, too. I know I have had many more that are funnier than that; some that could be the script to a movie. Sadly, I often forget them. I should keep a notebook beside my bed so I can jot them down while they are fresh in my memory. Do you keep a journal of your dreams? 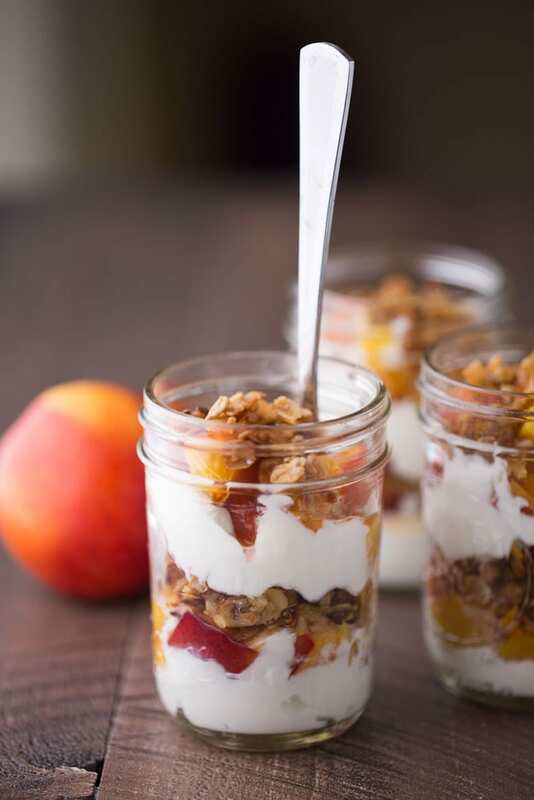 The ingredients list and instructions are lengthy but I promise these are very easy to make. They start off with cilantro lime brown basmati rice. I used leftover rice from a huge batch I had made a couple days prior. You can cook a fresh batch of rice, if you prefer. Sweet potatoes are seasoned with cumin, salt and pepper and sauteed until tender. Fresh pineapples are tossed with lemon juice, jalapeno, cilantro and red onions to create a flavorful salsa. Unsweetened shredded coconut is lightly toasted in a skillet. Then a delightful Greek yogurt avocado crema is whipped together for a final garnish. Place everything in serving bowls and then you’re ready to enjoy these tropical sweet potato burrito bowls! For the sweet potatoes. Toss the diced sweet potatoes with the cumin, ancho chili powder, extra virgin olive oil and ¼ tsp each of salt and pepper. Drizzle with the olive oil and toss to coat. Saute in a preheated skillet over medium high heat for 5-10 minutes or until tender. The potatoes may become slightly charred in some areas. That's ok. Once the potatoes are done cooking, turn off the stove and set aside the skillet. For the pineapple salsa. Place the pineapple, jalapeno, red onion and lime juice in a small mixing bowl. Mix well. Then cover and refrigerate until ready to use. For the avocado crema. Place the avocado, Greek yogurt, cilantro, garlic clove, lime juice and ¼ tsp of salt into a food processor. Process until the mixture is smooth and creamy. Cover and refrigerate until ready to use. For the cilantro lime brown rice. Place the rice, lime juice, ancho chili powder, cilantro and a pinch of salt and ground pepper in a mixing bowl. Mix well. For the toasted coconut. Whisk together the unsweetened coconut and mustard seed. Place in a preheated saucepan or skillet and toast for 3-5 minutes or until golden. Stir often so it doesn't burn. Heat the black beans in a microwave safe bowl in your microwave for about 1 minute. Assemble the bowls. Place ½ C of rice into each bowl. Divide the black beans, sweet potatoes and salsa among the four bowls. Then garnish each bowl with 1 tbsp of the toasted coconut. 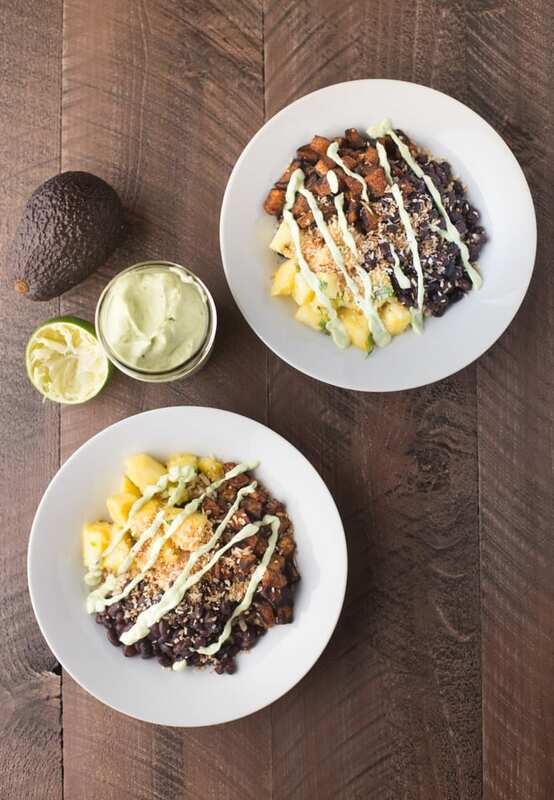 Drizzle each bowl with 2 tbsp of the avocado crema. Nutrition data is approximate and is based on the measurements that I used for each bowl. Store unused avocado crema in an airtight container in your refrigerator for up to 3 days. If serving less than 4 people, store unused ingredients in your refrigerator. The pineapple salsa is good for up to 2 days. All other ingredients will last up to a week (other than the crema, as noted above). sounds delish! Cumin flavored beans, pineapple salsa, a lot to like here! I have weird dreams all the time. My most recent one involved someone snoring very loudly in it and then when I woke up the snoring was still going on! I have the hubs to thank for that one. I am loving these tropical burrito bowls! Bowls full of delicious healthy ingredients are my favorite kinds of meals! LOL! I’m pretty sure I’ve had one of those dreams as well, Danae! Thank you for stopping by and for your comment, too. So happy you like this recipe! Julie! what a beautiful new blog. . so tell me more. . why two blogs?! and I love burrito bowls. . love the tropical spin and pineapple salsa!!! delicious! This is packed full of flavor and looks delicious! They always say dreams stem from subconscious thoughts which scares me! Thank you, Julie! Yeah, I have heard that about dreams as well. Scary! I love all of the flavors in this recipe!! And you can easily recreate throughout the week. Glad you like the flavors in this, Dani! The first time I made it, I recreated and took to work with me so I could have it for lunch. PERFECT lunch! I can never make sense of my dreams too, I totally need a notebook to keep track of them. These burrito bowls look amazing and loaded with flavor! I love all the spices and tropical spin on these! They’re perfect! Love this bowl idea! 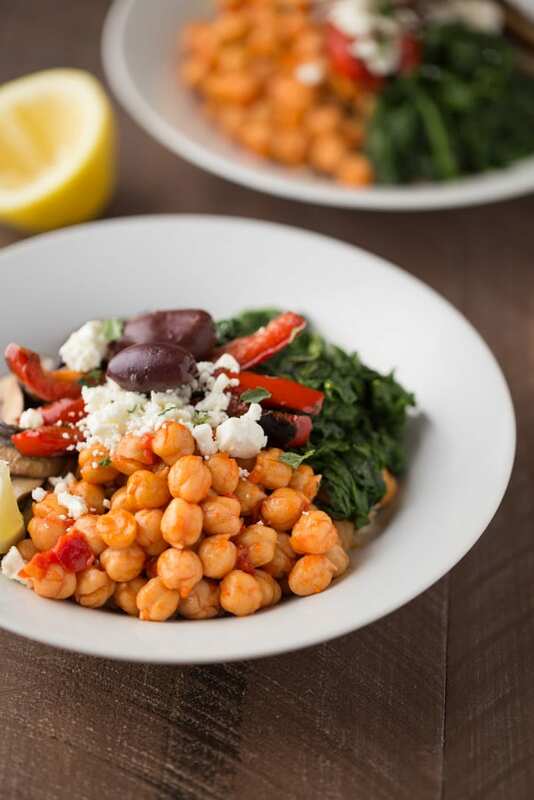 I’m a huge fan of bowls, piling everything and drizzle with sauce- perfect! Can’t wait to try this one. I love bowls, this one sounds incredible! pinned! I had the WEIRDEST dreams when I was pregnant. Apparently that’s normal?! Love this recipe – I have never thought about combining tropical flavors with sweet potatoes! Great post! First, I’ll admit, I do NOT like to cook. If a recipe has more than 5 ingredients my eyes glaze over and I continue on. However, you have put a lot of my loves in one bowl, so this is tempting! I’ll be trying this soon! Thank you for a yummy post!